Brown Fossil is a Natural material. Brown Fossil is a Medium priced Limestone stone. Brown Fossil is a wonder of the world, with its natural fossil’s imbedded within the material. Its mostly light/dark brown with many different types of fossils. Its normally found in traditional kitchens set in a very nice old cottage. With the right design it could also be used in a modern kitchen design. This material will be the talking point of any dinner party that you may hold. It is however a softer material and will need more looking after. For full details please ask one of the sales team how to keep this materials looking stunning for years to come. For fall cleaning instructions please see our limestone care sheet. Brown Fossil is a Natural Limestone from Morocco, Landford Stone offer this type of stone in a variety of thicknesses and finishes. 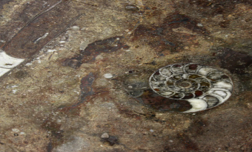 Brown Fossil is a Medium priced stone and will look incredible in your home!